My Grandma made the absolute best banana pudding. I’m not really a banana pudding fan. But, if Grandma made the banana pudding, then I went wild for it. The big difference between Grandma’s banana pudding and other banana puddings is that she actually made the pudding part. She did not buy a box of pudding mix. Grandma rarely ever bought convenience foods, so she made things that most people never think of making from scratch. In the case of pudding, the scratch pudding is much better in the banana pudding recipe. 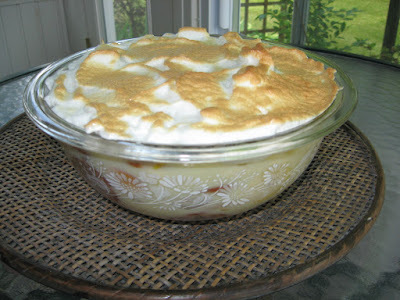 Another thing I especially enjoyed about Grandma’s homemade banana pudding was her meringue. The pudding calls for the two eggs yolks, and the whites are separated out to make the meringue. The end result here is the world’s best banana pudding. Sure. It takes a little time and effort. Most really fabulous dishes do. This one is worth every second. First scald the milk. Heat it until it forms a little skin on top. Do not use high heat and burn the bottom of the milk. Combine the sugar, salt, and flour and stir into the scalded milk. Pour this right in the pan where the meat has just been scalded. Cook over low to medium heat until the mixture thickens to a pudding consistency. Take a spoon of the hot mixture and put it in a bowl with the egg yolks only (saving egg whites for meringue). This is done to keep the eggs from curdling or turning into lumpy little gross bits of egg that do not taste good in the pudding or anything else for that matter. Adding just a spoon of the hot mixture over allows the eggs to adjust to the temperature. Once the hot mixture is stirred into the egg yolks, the egg yolks can be poured into the pudding mixture. At this point, the pot is off the heat but it’s still pretty hot – just having been thickened. Put the pot back on the heat and cook just a little longer to get the egg cooked and mixed well in with the milk mixture. Get a large bowl out. A mixing bowl is fine, but you’ll need to cover the top. Place a layer of Vanilla Wafers in the bowl on the bottom and up the sides as best you can. Some bowls are easier to line with wafers than others. Cover the Vanilla Wafers with a layer of bananas. Pour half the homemade pudding over the bananas. The homemade pudding will slowly engulf the bananas and cookies. Layer again the same as above. Put down a flat layer of cookies and cover with bananas in what will be the center of the pudding bowl. Pour the rest of the pudding over this middle layer. To make the meringue which goes on top of the completed pudding, beat the egg whites with a mixer and gradually add sugar. This will look a big like Cool Whip when ready. Spread the meringue over the top of the banana pudding. Use fingers to press meringue to edge of bowls. Otherwise, it shrinks and doesn’t look as pretty. Put meringue under the broiler in the oven very briefly. You just want a light brown on the edges and tips of the meringue. That’s how to make my Grandma’s banana pudding. It really can’t be beat. I’m totally spoiled when it comes to banana pudding. This is the only one that I’ll eat really. I discovered this recipe a while back. My husband was talking about the best Banana Pudding he'd ever had was his Grandma's. (His favorite dessert is Banana Pudding.) So, I went searching and found this recipe. Everyone in our household LOVES this! This is the BEST recipe by far! Thank you SO much for sharing! I thought I had lost it, as I wasn't able to find it via the Yes you can cook site...I'm SO happy that I found it again!